No 2 Mount Salus is one of a pair of Victorian homes. Built in approx 1841 it exemplifies period architecture at its finest with its stunning granite cut features including an impressive portico and two bay windows which have been referred to in Peter Pearson's book from the Mountains to the Sea as "half-octagonal bow windows". This impressive 5 bedroom double fronted Victorian family home (343.59 Sq.m / 3,698.37 Sq.ft) is located in this enviable and exclusive address off Knocknacree road, Dalkey, Co. Dublin. 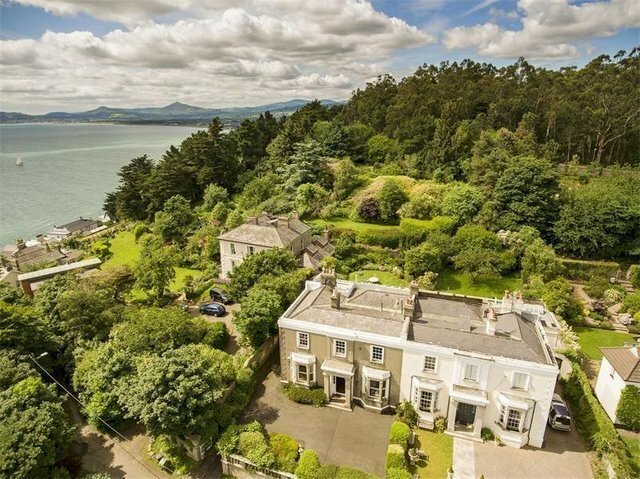 Nestled at the end of a quiet private cul de sac on an elevated setting of approximately 1.07 acres, Number 2 enjoys exceptional sea views over Dublin Bay towards Howth, Dalkey Island, and southwards towards Bray Head. In 1854, Cardinal John Henry Newman spent some time in 2 Mount Salus whilst establishing the Catholic University, now UCD. During his stay at the property he wrote to his sister "...the place is as beautiful as it is healthy. The house is on the rocks which rise above Dublin Bay - and commands a view of the whole coast and headlands. The Wicklow Mountains are seen out one window, Howth and Kingstown out the other. I never saw a place out of Italy and Sicily like it for beauty of rock and sea..."
With marvellous sea views from many of the rooms, the home also retains many of its original features including feature high ceilings, detailed cornicing and shuttered sliding sash windows. Accommodation comprises of an entrance porch, reception hall, dual aspect living room, dining room, kitchen, inner hallway, utility / shower room, back kitchen with access to a pantry and garden store. The return comprises a library, family room, guest wc and small conservatory with access to the rear garden. The first floor is presented with a generous landing and 5 bedrooms (three doubles with master en-suite and two singles), and a family bathroom. An additional benefit of the home is the self-contained mews to the side which is presented with a study, double bedroom, shower room and dual aspect open plan kitchen / living area with sea views on the first floor. Planning permission has been granted to extend the main accommodation and Mews. The home is approached through gated entrance with high cut stone granite walls and generous off-street parking. The private and mature rear gardens are set out over Killiney Hill and enjoy magnificent views over Howth, Sorrento Terrace, Dalkey Island and Killiney Bay. The gardens are presented with a combination of mature trees, croquet lawn, wonderful pathway walks with colourful borders and a sunny south westerly orientation. Located off Knocknacree Road in the heart of Dalkey, the home is within a leisurely walk of the heritage Town with its feature shops, bijou restaurants and hostelries. For those who enjoy the outdoors, there are a wide range of recreational amenities including tennis, GAA golf and sailing clubs and hill walking over Dalkey and Killiney Hills and Killiney Beach. A number of South County Dublin's most desirable primary and secondary schools are located nearby and include Holy Child, Loreto Abbey, Castlepark, The Harold, St. Andrews, and Blackrock College. Transportation links are well catered for and include the DART at Killiney, LUAS at Cherrywood, Aircoach from Fitzpatrick's Hotel, the M50 and N11 road networks. Dublin City Centre is approximately 35 minutes by car.